You may also be interested in the course records. 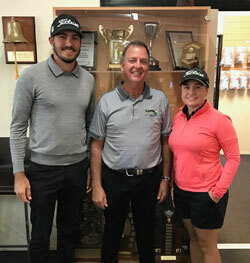 A new course record has been set by Mandurah golfer Hayley Bettencourt, who shot a round of 2 under par (70). 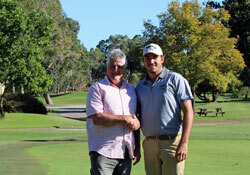 Young professional golfer playing the Australian, Asia and European played Nullarbor Links and equalled the course record set by Mandurah Golfer Ian Darwen back in December 2011. Matt Jager who plays and is a product, of the Melville Glades Golf Club, shot a round of 72 (one under par) to equal the standing record. He completed the course at Kalgoorlie on 31st of March 2014. 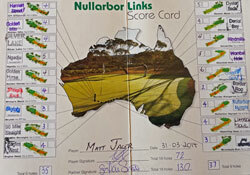 Matt rates Nullarbor Links as “challenging, but a lot of fun”. 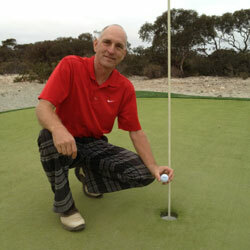 The second hole in one on Nullarbor Links has been sunk. 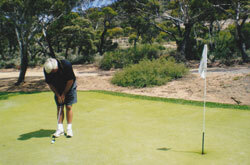 Edward Down from Brisbane has achieved the difficult task at the Par 3 Border Kangaroo hole. 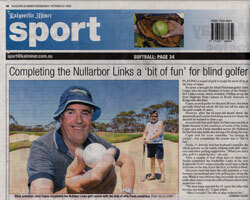 A new course record of 72 has been established for Nullarbor Links. 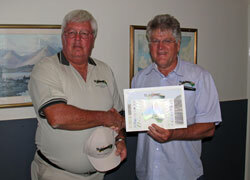 Mandurah Country Club golfer Ian Darwen played the course completing it on the 31st of December 2011. Ian has played golf for many years and was once a professional player. 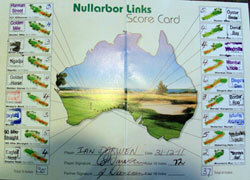 Ian rates Nullarbor Links as one of the most challenging course he has ever played. "But I loved every minute of it and I will play again". Playing a round of golf is tough for most of us at the best of times. So spare a thought for blind Victorian golfer John Capes, who has just finished 18 holes of the World's Longest Golf Course. 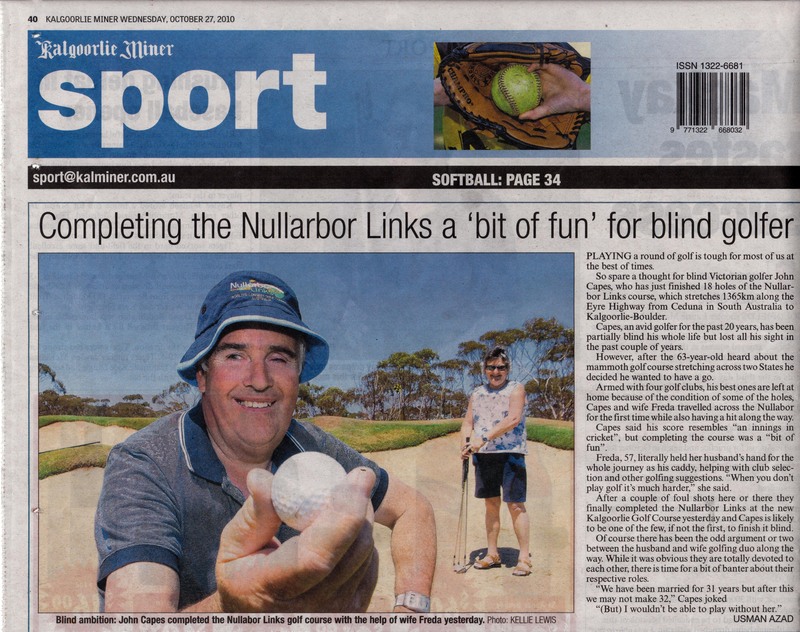 Cindy and Brian Bushfield, two very keen golfers from Canada have walked the entire Nullarbor Links Golf Course. The two fundraisers arrived in Kalgoorlie on Tuesday 13 April 2010. What an amazing adventure, It takes a great deal of courage and conviction to attempt this amazing feat and raise funds for the Royal flying Doctor Service. Cindy and Brian have experienced some extreme conditions. 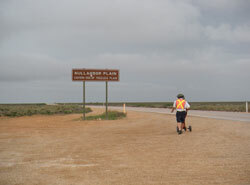 They left Ceduna in 40 degree heat and spent a day walking on the rain at Eucla. The task that they have completed has presented many challenges to them, but with courage, they have conquered this tough and unrelenting journey. We congratulate Brian and Cindy after having completed their walk. We encourage everyone in Australia to raise their glass and afford these two wonderful characters all the accolades that this amazing completed task deserves. The Eyre Highway Operators Association, Operators of Nullarbor Links, congratulates and honour Brian and Cindy Bushfield. You are special people. The very first hole in one has been sunk. 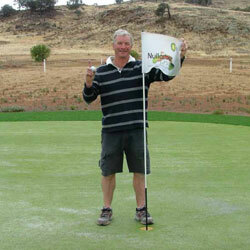 Tasmanian Golfer Chris Salmon has achieved the difficult task at the Sheep's Back hole on Fraser Range.